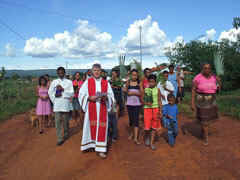 After three months with the Villa Maria community at Hunters Hill, NSW, Kiwi missionary, Fr Paddy O'Neil SM, returns to the remote mission of Palmas de Monte Alto in Brazil. Fr Paddy came to Australia armed with many images of his work amongst the rural people of the north; some are included below. From top left: Early 18th-century statues from Portugal adorn Fr Paddy's parish church; Fr Paddy on the eve of his return to Brazil, with former missionary in Brazil, Fr Paul Mahony; Fr Paddy with parishioners of Palmas de Monte Alto and its country outstations. Parishioner, Mark Mullins, has produced an attractive and valuable resource for the parish of Villa Maria, Hunters Hill, NSW, through a book about one of its two churches: Villa Maria. 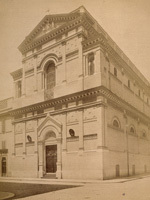 The book contains images and descriptions of the dozens of statues, windows and plaques which give this historic place of worship so much of its character. It provides succinct accounts of the Marists' coming to the area in the mid-19th century and the construction of churches and monastery buildings in the area, as well as brief pen-portraits of the key figures of the early history of the parish. Having come to the parish thirty years ago, Mark Mullins comments: "I was struck by the extent and variety of the images in the church... and thought it would be desirable if parishioners and visitors had a guide to the rich iconology they offered." 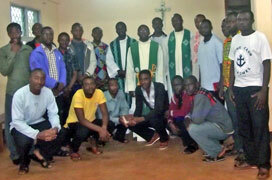 Sixteen young Cameroonians gather at Bambili with Frs Jean Pierre Bakhoum SM (Senegal), Christian Abongbung SM and Deogratias Bararishize SM (Burundi), to consider Marist life. "The Marist community of Bambili is holding a 3-day live-in experience for Marist interested candidates from around the anglophone region of Cameroon. 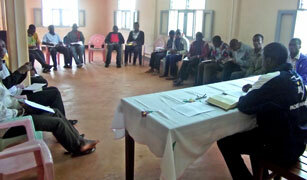 "It started on Aug 17 with 16 young men from forms 6 up to 2nd year university level. We are hoping that some might be interested in joining us next year. "We also ask for prayers that these young men may have the courage to respond to Lord's call in the Society of Mary. (I also used some material from the Aussie Marist website!)" 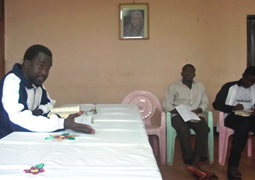 Left: Fr Jean Pierre Bakhourn, community vocations promoter, Senegal, reflects on Marist life with 16 interested young men. 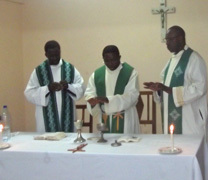 Right: Frs Jean Pierre, Christian and Deogratias at the live-in Eucharist. 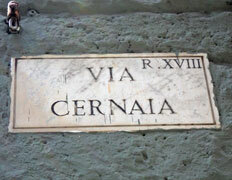 The former house for international Marist formation in Rome, known by Marists simply from its location in 'Via Cernaia', has re-opened its doors to provide first class accommodation and conference facilities as 'Domus Australia'. As an enterprise of some dioceses in Australia, principally of the Archdiocese of Sydney, the property was purchased from the Marist Fathers after several generations of Marist post-graduate students had pursued theological and scriptural courses there. Sydney's Cardinal George Pell comments: "Domus Australia will provide Australians with a true pilgrimage experience and further strengthen the links between the Church in Australia and the Church in Rome. It will be a real home away from home for travelling Australians." Domus Australia's beautifully renovated chapel is appropriately dedicated to Marist Saint and Australian patron, St Peter Chanel. 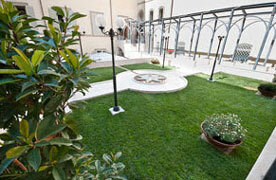 Visit the Domus Australia web site for a comprehensive look at this new facility. After conversations last year with Year 9 students of Marist College, Burnie, Tas, sculptor, Pauline Clayton, has produced a work in bronze influenced by the story of the Good Samaritan. 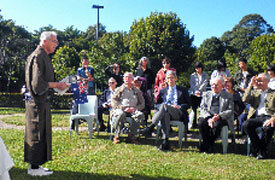 The statue was blessed by parish priest, Fr Tony Kennedy SM, during the College's feast day celebrations on Aug 18. Fr Tony comments: "The figure seems to fit in so well with the ethos of Marist College: respect, responsibility, compassion, hospitality and Justice are the College values." Pauline Clayton explains: "Every day we alternate between the characters of the two figures. Sometimes we are strong and others can depend on us. At other times we are the person in need of the support. 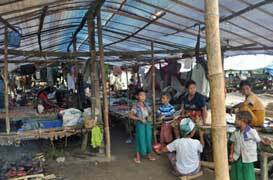 "The face of the major figure is asking us ... 'Who is my neighbour? Who am I a neighbour to?' 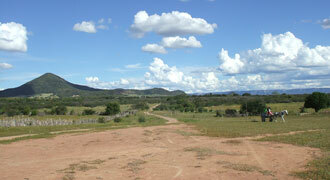 I like to see the work as a challenge to live out the story of the Good Samaritan. The steadfast friend who goes the extra mile to ease the others burden. " Marist College's 'Good Samaritan' statue is blessed in the memorial gardens in front of the college. 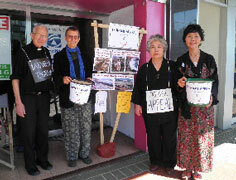 Residents of Sydney 'Rocks' district are amongst those who mourn the passing of Sister Joan Sheppard. After decades of catechetical ministry in Sydney's western suburbs, Sr Joan joined the pastoral team of St Patrick's, Church Hill, NSW, in 1987 where she was a much-loved pastoral presence for several years. The Marist Sisters and Marist Missionary Sisters have long worked alongside the priests of St Patrick's..
Sr Joan died peacefully at Our Lady of Consolation Nursing Home, Rooty Hill, NSW. on Aug 17, having recently celebrated her diamond jubilee as a Marist Sister. May she rest in peace. 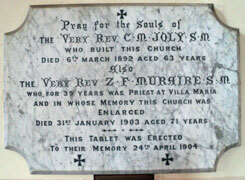 A new resource about the life of Marist founder, Fr Jean-Claude Colin, is now available from this web site. 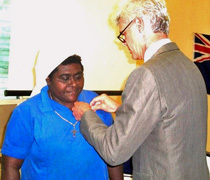 In a ceremony on Aug 03, Bougainvillean Sister Lorraine Garasu CSN was awarded the Order of Australia by Australia's High Commissioner to PNG. The award follows years of post-crisis work amongst her native Bougainvilleans assisting displaced families, sexually abused youths and young women victims of domestic violence, as well as trauma counselling rehabilitation, agricultural youth programs, and safety for those in trouble, especially women and children. Sr Lorraine acknowledges the part that Marists have played in her life, saying: "There were many things that gave support to this award. It all started with the work done with Marist Mission Centre, and their handling of AUSAID funding... and their encouragement and support, their wisdom and knowledge." Congratulations, Sister Lorraine! 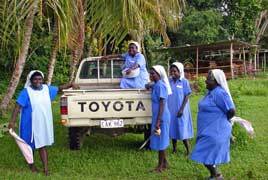 Sr Lorraine (far left) with other Sisters of Nazareth at Chabai, Bougainville, PNG, near the Nazareth Centre for Rehabilitation. 2. 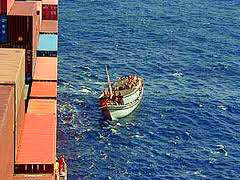 Sr Lorraine / crossing Buka passage with Marist Mission Centre director in 2004. 3. 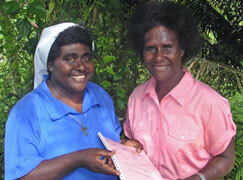 AusAID-MMC supported programs helped Sr Lorraine work for the development of women in post-crisis Bougainville. 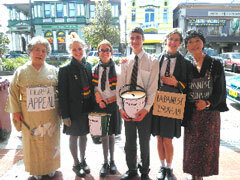 Former Marist missioner in Japan, Fr Paul Glynn SM, was central to the recent street collections held throughout downtown Lismore, NSW, in aid of the tsunami victims of Sendai, Japan. Fr Paul also led indoor and outdoor events of prayer and awareness raising for the people of Lismore including a Mass at St Carthage's cathedral. Five religious from various Marist congregations were among the graduates of the Marymount Centre's 'Journeying with new members' program which concluded on Aug 06 along with the 'New Life' program. The six-month course for those involved in formation ministry ended with a thanksgiving Eucharist in the Marymount Mercy Centre chapel, Castle Hill, NSW. Pictured, left, are four of the Marists: Br Simon Serero FMS (PNG), Br Afaese Afaese FMS (Samoa), Sister Vilomena Ruru SM (Fiji) and Fr Justin Ratsi SM (PNG-Bougainville). A fifth, Fr Soane Ahohako SM (Tonga), left a few days earlier to take up his formator's role at Marist College, Suva. 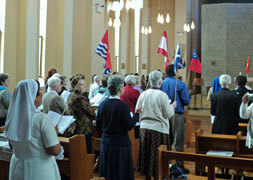 Scenes from the Thanksgiving Eucharist.... national flags of all participants carried in procession.... Fr Justin Ratsi leading the music ministry.... the graduates recite a missioning prayer. The English version of 'Bearings', Fr Craig Larkin's book on the Marist Constitutions, has been released. French and Spanish versions will follow after Rome's summer break. 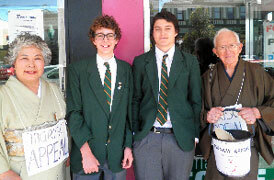 The book will assist Marists in their re-appropriation of the Constitutions called for by the General Chapter of 2009. A 'Year of the Constitutions' will begin on Sep 12, 2011, and end on the same date in 2012, the 25th anniversary of the approval of the Society of Mary's renewed constitutions after Vatican II. Superior-General, Fr John Hannan, writes: "The intention of Craig Larkin through this creative presentation is to enable today's Marists to reflect prayerfully upon the Constitutions... to absorb through the lived experiences of our fellow Marists the deeper content of our rule of life. "The witness of our forebears is a sure way to help us to approach the Constitutions in an imaginative way and to discover pathways to an ever deeper understanding of our Marist Call." 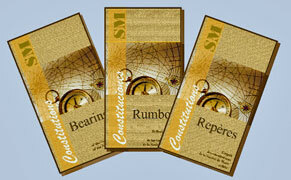 Left: The three language versions of 'Bearings'. 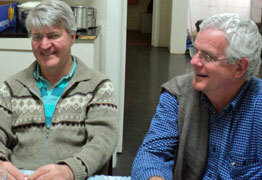 Right: Fr Craig Larkin with a volume of letters received from pioneer Oceania missionaries. 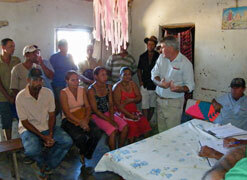 Their stories provide impelling examples of living the Marist rule. The Studio of St John the Baptist, Auckland, NZ, has finished work on an official icon of Marist Founder, Jean-Claude Colin. 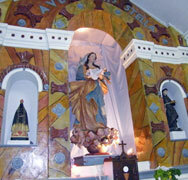 The icon features Fr Colin receiving a script from the Blessed Virgin indicating how the congregation he was to found would live 'under Mary's name' ('Sub Mariae Nomine'). 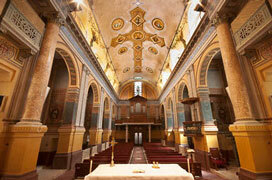 The icon will be used on materials to promote the Cause for Beatification of Fr Colin.